CyberCars – Site under reconstruction. In case of problems, go to www.cybercars.org…. This is a blog about Cybercars and fully automated vehicles. Cybercars are road vehicles with fully automated driving capabilities at low to medium speed. A fleet of such vehicles forms a managed transportation system (called a CTS for Cybernetics Transportation System), for passengers and/or goods, on a restricted network of roads with on-demand and door-to-door capability. This concept emerged in Europe in the early 1990’s and was introduced for the first time in the Netherlands in December1997 for passenger transport at Schipol airport. Since then, it has been developped under a number of European projects such as CyberCars, CyberMove, EDICT, Netmobil, CyberC3, CyberCars-2, CATS and CityMobil A new project, also supported by the European Commission, is now under way : CityMobil2 and is focused on large scale demonstrations of cybercars in five European cities. CTS are actually a combination of 2 innovative concepts: carsharing and automated vehicles. This is why this blog is interested in these 2 topics. Automation can bring great advantages to the carsharing concept by solving the movement of empty vehicles between stations and inside large parking lots. Automation can also bring individual mobility to those who cannot (or should not) drive a car. At the moment, the projects focus on low speed automation (up to 30km/h) because this speed is well adapted to urban environments, even in the presence of human obstacles and it should allow the operation in full automatic mode without any on-board supervision. However, higher speed can be considered in dedicated environments with full protection from unexpected obstacles. Cybercars can be in full automation mode all the time (except for maintenance) or in dual mode: full automation or manually driven. This last case is explored in the CATS Project and should interest the operators of c arsharing fleets. 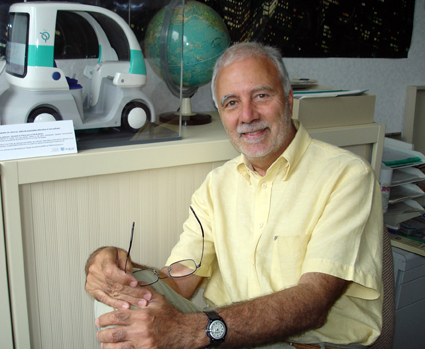 This blog is maintained by Michel Parent (michel.parent at cybercars.fr) who is one of the initiators of the cybercars concept and founder of the IMARA research team at INRIA, a large public research organisation in France.